What a loving thing to do, Jeanette. Please pray for my friend Robin. She has been batttling cancer for five years and I is so strong. She starts an new chemo in January. Jeanette, thanks for the link up. 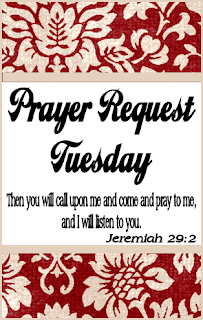 I had NO idea you could have a prayer request link up... I think I might take your idea and use it later! Love the blog, I'm your newest follower from the blog party, and I'll make sure to link up again! Some friends of mine have been struggling with secondary infertility - they're pregnant now, and any prayers for the safety of their unborn child would be very much appreciated.